When a shirt needs to fit a taller wearer like a second skin, turn to 5.11 Tactical's Stryke TDU Long Sleeve Shirt Tall (72416T). This shirt allows users to move freely while offering plenty of tactical advantages. The polyester and Spandex torso keep moisture at bay and offer just the right amount of cling to the body. The shoulders and sleeves are constructed of patent-pending, Flex-Tac® mechanical stretch fabric to provide flexibility and an excellent range of motion. A Teflon® treatment repels dirt and moisture. Adjustable cuffs, a front zipper and the Mandarin collar maximize wearer comfort. Canted chest pockets, vertical sleeve pockets and reinforced, articulated elbows aid in performance. 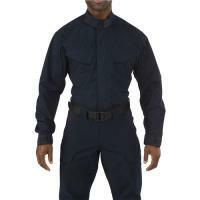 A badge tab, loop patch platform and epaulette kit are included to customize the shirt to meet uniform specifications.